DERRY CITY Chairman, Mr Philip O’Doherty doesn’t expect the FAI to have any objections to the club’s plans to split its final six home fixtures of the 2016 season between Maginn Park and Riverside Stadium. The FAI have inspected both facilities this week and are preparing to present Derry City with its findings regarding the stadiums’ suitability for hosting League of Ireland Premier Division matches. We could probably name both venues or either one but we’re waiting on the FAI to give us their official feedback. It’s understood that, in the spirit of the competition, the FAI are not willing to reverse Derry City’s home fixtures, therefore a viable alternative must be found while Brandywell Stadium undergoes redevelopment this summer. And the Association confirmed yesterday they are currently in talks with Derry City to ‘develop a solution’. 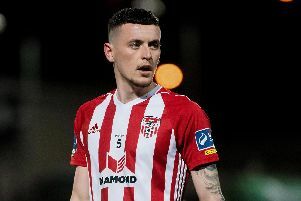 “Officials from the FAI have visited both Maginn Park in Buncrana and Riverside Stadium in Derry and are working with Derry City to develop a solution,” said an FAI Spokesman. Derry City Chairman, Mr O’Doherty, currently in North Carolina on business, is patiently awaiting news from Abbotstown and revealed he is open to splitting the fixtures between both stadiums if required. And he doesn’t expect any ‘show-stoppers’ from the FAI, as he considers both venues to be viable options. Maginn Park, however, would need improvements in order to meet the FAI’s criteria for hosting Premier Division games and Mr O’Doherty insists Derry City are willing to help fund any refurbishment work needed. “We could probably name both venues or either one but we’re waiting on the FAI to give us their official feedback,” said Mr O’Doherty. “At the minute we’re thinking it’s probably 50/50 between both venues. Mr O’Doherty claims he doesn’t have a personal preference with both venues having its own individual advantages. “It’s good to have both options,” he said. “Obviously Maginn Park has a nice playing surface and the Riverside is closer. But we would like to maintain good relationships with everyone concerned. We discussed playing half the matches at Institute and half in Buncrana. We mentioned that to the FAI but they haven’t got back to us on what their feelings are just yet. So we’re waiting on their response.